You probably remember January 9 of last year. . . . That was the day on which the St. Petersburg proletariat came face to face with the tsarist government and, without wishing to do so, clashed with it. Yes, without wishing to do so, for the proletariat went peacefully to the tsar for "bread and justice," but was met as an enemy, with a hail of bullets. It had placed its hopes in portraits of the tsar and in church banners, but both portraits and banners were torn into shreas and thrown into its face, thus providing glaring proof that arms must be countered only by arms. And it took to arms wherever they were available -- it took to arms in order to meet the enemy as an enemy and to wreak vengeance on him. But, leaving thousands of victims on the battle-field and sustaining heavy losses, the proletariat retreated, with anger burning in its breast. . . . This is what January 9 of last year reminds us of. Today, when the proletariat of Russia is commemorating January 9, it is not out of place to ask: Why did the St. Petersburg proletariat retreat after the clash last year, and in what way does that clash differ from the general clash that took place in December? First of all it retreated because then it lacked that minimum of revolutionary consciousness that is absolutely essential if an uprising is to be victorious. Can the proletariat that goes with prayer and hope to a bloody tsar who has based his entire existence on the oppression of the people, can the proletariat which trustiully goes to its sworn enemy to beg "a crumb of charity" -- can such people really gain the upper hand in street fighting?. . . True, later on, after a little time had passed, rifle volleys opened the eyes of the deceived proletariat and revealed the vile features of the autocracy; true, after that the proletariat began to exclaim angrily: "The tsar gave it to us -- we'll now give it to him!" But what is the use of that when you are unarmed? What can you do with bare hands in street fighting, even if you are enlightened? For does not an enemy bullet pierce an enlightened head as easily as an unenlightened one? Yes, lack of arms -- that was the second reason for the retreat of the St. Petersburg proletariat. But what could St. Petersburg have done alone even if it had possessed arms? When blood was flowing in St. Petersburg and barricades were being erected, nobody raised a finger in other towns -- that is why the government was able to bring in troops from other places and flood the streets with blood. It was only afterwards, when the St. Petersburg proletariat had buried its fallen comrades and had returned to its everyday occupations -- only then was the cry of workers on strike heard in different towns: "Greetings to the St. Petersburg heroes! " But of what use were these belated greetings to any body? That is why the government did not take these sporadic and unorganised actions seriously; the proletariat was split up in separate groups, so the government was able to scatter it without much effort. Hence, the third reason for the retreat of the St. Petersburg proletariat was the absence of an organised general uprising, the unorganised action of the proletariat. But who was there to organise a general uprising? The people as a whole could not undertake this task, and the vanguard of the proletariat -- the proletarian party -- was itself unorganised, for it was torn by internal disagreements. The internal war, the split in the party, weakened it more and more every day. It is not surprising that the young party, split into two parts, was unable to undertake the task of organising a general uprising. Hence, the fourth reason for the proletariat's retreat was the absence of a single and united party. And lastly, if the peasantry and the troops failed to join the uprising and infuse fresh strength into it, it was because they could not see any exceptional strength in the feeble and short-lived uprising, and, as is common knowledge, nobody joins the feeble. That is why the heroic proletariat of St. Petersburg retreated in January last year. Time passed. Roused by the crisis and lack of rights, the proletariat prepared for another clash. Those who thought that the losses sustained on January 9 would crush the fighting spirit of the proletariat were mistaken -- on the contrary, it prepared for the "last" clash with greater ardour and devotion, it fought the troops and Cossacks with greater courage and determination, The revolt of the sailors in the Black Sea and Baltic Sea, the revolt of the workers in Odessa, Lodz and other towns, and the continuous clashes between the peasants and the police clearly revealed how unquenchable was the revolutionary fire burning in the breasts of the people. The proletariat has recently been acquiring with amazing rapidity the revolutionary consciousness it lacked on January 9. It is said that ten years of propaganda could not have brought about such an increase in the proletariat's class consciousness as these days of uprising have done. That is so, nor could it be otherwise, for the process of class conflicts is a great school in which the revolutionary consciousness of the people grows hour by hour. A general armed uprising, which at first was preached only by a small group of the proletariat, an armed uprising, about which some comrades were even doubtful, gradually won the sympathy of the proletariat -- and it feverishly organised Red detachments, procured arms, etc. The October general strike clearly demonstrated the feasibility of simultaneous action by the proletariat. This, in its turn, proved the feasibility of an organised uprising -- and the proletariat resolutely took this path. All that was needed was a united party, a single and indivisible Social-Democratic Party to direct the organisation of the general uprising, to co-ordinate the preparations for the revolution that were going on separately in different towns, and to take the initiative in the assault. That was all the more necessary because life itself was preparing the ground or a new upsurge -- day by day, the crisis in the towns, starvation in the countryside, and other factors of a similar nature were making another revolutionaly upheaval inevitable. The trouble was that such a party was then only in the process of formation; enfeebled by the split, the party was only just recovering and beginning to unite its ranks. It was precisely at that moment that the proletariat of Russia entered into the second clash, the glorious December clash. Let us now discuss this clash. In discussing the January clash we said that it lacked revolutionary consciousness; as regards the December clash we must say that this consciousness existed. Eleven months of revolutionary storm had sufficiently opened the eyes of the militant proletariat of Russia, and the slogans: Down with the autocracy! Long live the democratic republic! became the slogans of the day, the slogans of the masses. This time you saw no church banners, no icons, no portraits of the tsar -- instead, red flags fluttered and portraits of Marx and Engels were carried. This time you heard no singing of psalms or of "God Save the Tsar" -- instead, the strains of the Marseillaise and the Varshavyanka deafned the tyrants. Thus, in respect to revolutionay consciousness, the December clash differed radically from the January clash. In the January clash there was a lack of arms, the people went into battle unarmed. The December clash marked a step forward, all the figlters now rushed for arms, with revolvers, rifles, bombs and in some places even machine guns in their hands. Procure arms by force of arms -- this became the slogan of the day. Everybody sought arms, everybody felt the need for arms, the only sad thing about it was that very few arms were procurable, and only an inconsiderable number of proletarians could come out armed. The January uprising was utterly sporadic and unorganised; in it everybody acted haphazard. In this respect, too, the December uprising marked a step forward. 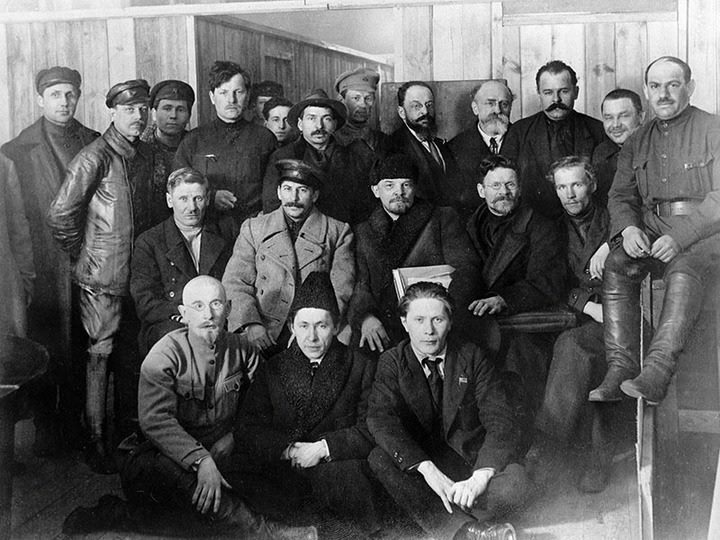 The St. Petersburg and Moscow Soviets of Workers' Deputies, and the "majority" and "minority" centres "took measures" as far as possible to make the revolutionary action simultaneous. They called upon the proletariat of Russia to launch a simultaneous offensive. Nothing of the kind was done during the January uprising. But that call had not been preceded by prolonged and persevering Party activity in preparation for the uprising, and so the call remained a call, and the action turned out to be sporadic and unorganised. There existed only the desire for a simultaneous and organised uprising. The January uprising was "led" mainly by the Gapons. In this respect the December uprising had the advantage in that the Social-Democrats were at the head of it. The sad thing, however, was that the latter were split into separate groups, that they did not constitute a single united party, and, therefore, could not co-ordinate their activities. Once again the uprising found the Russian Social-Democratic Labour Party unprepared and divided. . . . The January clash had no plan, it was not guided by any definite policy, the question whether to take the offensive or defensive did not confront it. The December clash merely had the advantage that it clearly raised this question, but it did so only in the course of the struggle, not at the very beginning. As regards the answer to this question, the December uprising revealed the same weakness as the January one. Had the Moscow revolutionaries adhered to the policy of offensive from the very beginning, had they at the very beginning attacked, say, the Nikolayevsky Railway Station and captured it, the uprising would, of course, have lasted longer and would have taken a more desirable turn. Or had the Lettish revolutionaries, for example, resolutely pursued a policy of offensive and had not wavered, then they undoubtedly would first of all have captured batteries of artillery, thereby depriving the authorities of all support; for the authorities had at first allowed the revolutionaries to capture towns, but later they passed to the offensive and with the aid of artillery recaptured the places they had lost. The same must be said about other towns. Marx was right when he said: In an uprising only audacity conquers, and only those who adhere to the policy of offensive can be audacious to the end. This was the cause of the proletariat's retreat in the middle of December. If the overwhelming mass of the peasantry and troops failed to join in the December clash, if that clash even roused dissatisfaction among certain "democratic" circles -- it was because it lacked that strength and durability which are so necessary for the uprising to spread and be victorious. From what has been said it is clear what we, the Russian Social-Democrats, must do today. Firstly, our task is to complete what we have begun -- to form a single and indivisible party. 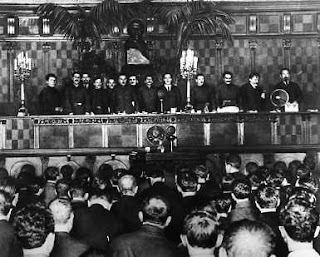 The all-Russian conferences of the "majority" and the "minority" have already drawn up the organisational principles of unification. Lenin's formula defining membership of the Party, and democratic centralism, have been accepted. The respective centres that direct ideological and practical activities have already merged, and the merging of the local organisations is already almost completed. All that is needed is a Unity Congress that will officially endorse the unification that has actually taken place and thereby give us a single and indivisible Russian Social-Democratic Labour Party. Our task is to facilitate the execution of this task, which is so precious to us, and to make careful preparations for the Unity Congress, which, as is known, should open in the very near future. Secondly, our task is to help the Party to organise the armed uprising, actively to intervene in this sacred cause and to work tirelessly for it. Our task is to multiply the Red detachments, to train and weld them together; our task is to procure arms by force of arms, to reconno&icirctre the disposition of government institutions, calculate the enemy's forces, study his strong and weak sides, and draw up a plan for the uprising accordingly. Our task is to conduct systematic agitation in favour of an uprising in the army and in the villages, especially in those villages that are situated close to towns, to arm the reliable elements in them, etc., etc. . . .
Thirdly, our task is to cast away all hesitation, to condemn all indefiniteness, and resolutely to pursue a policy of offensive. . . . In short, a united party, an uprising organised by the Party, and a policy of offensive -- this is what we need today to achieve the victory of the uprising. And the more famine in the countryside and the industrial crisis in the towns become intensified and grow, the more acute and imperative does this task become. Some people, it appears, are beset with doubts about the correctness of this elementary truth, and they ask in a spirit of despair: What can the Party, even if it is united, do if it fails to rally the proletariat around itself? The proletariat, they say, is routed, it has lost hope and is not in the mood to take the initiative; we must, they say, now expect sa]vation to come from the countryside; the initiative must come from there, etc. One cannot help saying that the comrades who argue in this way are profoundly mistaken. The proletariat is by no means routed, for the rout of the proletariat means its death; on the contrary, it is as much alive as it was before and is gaining strength every day. It has merely retreated in order, after mustering its forces, to enter the final clash with the tsarist government. When, on December 15, the Soviet of Workers' Deputies of Moscow -- the very Moscow which in fact led the December uprising -- publicly announced: We are temporarily suspending the struggle in order to make serious preparations to raise the banner of an uprising again -- it expressed the cherished thoughts of the entire Russian proletariat. With whom are we dealing, with Socialist-Revolutionaries or Social-Democrats? For no Social-Democrat will doubt the truth that the actual (and not only ideological) leader of the rural population is the urban proletariat. At one time we were assured that the autocracy was crushed after October 17, but we did not believe it, because the rout of the autocracy means its death; but far from being dead, it mustered fresh forces for another attack. We said that the autocracy had only retreated. It turned out that we were right. . . .
No, comrades! The proletariat of Russia is not defeated, it has only retreated and is now preparing for fresh glorious battles. The proletariat of Russia will not lower its blood-stained banner; it will yield the leadership of the uprising to no one; it will be the only worthy leader of the Russian revolution.